Have you ever put your biggest couch in front of your fireplace during the summer months? An unused fireplace can look so lonely and drab! The Linden mantel shelf will change the focal point in any room of your choice with its simple yet classy style. You will find yourself moving that couch to face the beautiful Pearl Mantel even when there is no flame below. This easily assembled piece provides a mitered hanger board. 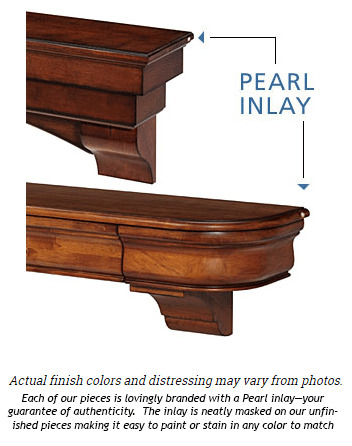 Look for that pearl inlay on the right side to be assured you have the legitimate product. Choose a finished wood, or do it yourself. What wood is this mantel made from? This is made from Asian Choi Hardwood. How "tall" is this fireplace mantel? This mantel is 7" tall. What is the lower length of the 72" fireplace mantel? The bottom length of the 72 inch version of this shelf is 66 inches. If I order a 60 inch mantel, how wide is the bottom portion of the mantel? For the 60 inch version of this shelf, the bottom length will be 54 inches across. I was very impressed with the Mantel. Nicer than I expected it to be. Very Pleased! This is the second such product we have purchased, the first one from another company. We built our own fireplace surround both times for two different houses. This shelf was definitely superior in quality for a somewhat lesser price, and the craftsmanship was definitely of a higher quality. I would highly recommend this seller to anyone seeking fireplace accessories. ProsFirst rate construction and luxurious in appearance.